Reaper Back in Re-Runs? Eh. Reaper Back for a One-Off Reunion Special? Better. 1 Comment on Reaper Back in Re-Runs? Eh. Reaper Back for a One-Off Reunion Special? Better. Beginning June 4th, re-runs of Reaper will be added to the network’s Tuesday night schedule, paired with returning original comedy Holliston. All of Reaper‘s 31 episodes, which originally aired on the CW in the US from 2007-2009, will eventually air. 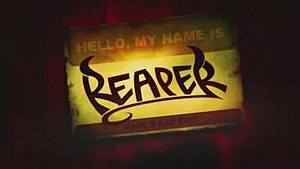 To celebrate the return of Reaper, albeit merely in syndication with no new episodes, the network will produce and air a reunion special in which core cast members return to participate in a round-table discussion of the show. Nowhere near as nerd-centric as Big Bang Theory nor as cloying as Chuck, both of which also began their respective runs in 2007, Reaper centered on a beta-male type (Sam, played by Bret Harrison) who has to work for the devil as a bounty hunter of escaped souls due to a deal his parents made with the Devil prior to his birth. His eccentric best friends, the gregarious Sock (Labine) and fastidious Ben (Rick Gonzalez), help him out. Perhaps not surprising considering he had the flashiest role, Ray Wise‘s remarkably hilarious turn as the constantly amused Devil stole the show. Wise played the Devil as equally delighted by his own fiendishness and Sam’s ineffectiveness (e.g., Sam tries to summon the devil by drawing a pentagram on the ground, but accidentally draws a star of David, about which the Devil chuckles before excitedly proclaiming, “Mazzeltov!”). The show’s formula was for the Devil to appear to Sam early on, usually pulling him straight out of his job at a Home Depot-esque store into a comedic situation like a fancy restaurant where Sam’s work clothes make him horribly under-dressed . The Devil would give Sam the details of a new escaped soul and provide an ironic or just plain comically insufficient vessel to be used to re-collect the soul, with the vessel appearing to be an everyday item like a Zippo lighter. Thus, Sam and his friends would have to hunt down and capture a soul which appeared to anyone else to be a normal person. All the while, Sam had to maintain his job and navigate a will-they/won-they with best friend Andi (Missy Peregrym). The show weaved serialized stories throughout seasons, such as Sam becoming entangled with a rebellion against the Devil in the first season and Sam attempting to discover a way to get out of his contract with the Devil in the second season. ABC Studios attempted to save the show after its cancellation, but was unable to find a new home at SyFy or elsewhere when Harrison and Labine moved on to different projects. Post-Reaper, Harrison has starred in the now-canceled Breaking In and Labine has a couple of short-lived sitcoms and cult favorite indie films under his belt. In fact, if you liked Reaper you owe to yourself to check out Labine’s horror film spoof Tucker & Dale Vs. Evil. Wise, a career character actor most known for his twisted role on Twin Peaks and scene-stealing in Reaper, has returned to being that guy who pops up here (How I Met Your Mother) and there (Burn Notice). He is currently a regular on Adult Swim’s 60 Minutes-spoofing Newsreaders in which he plays an angry, old man commentator, ala Andy Rooney. Missy Peregrym is a regular on the Canadian police drama Rookie Blue, which airs in the US on ABC. If you’re thinking “well, I haven’t heard of that show before” that might be because all three of its seasons to date have aired during the summer. The reunion special, which does not yet have an air date (unless it’s implied to air the same day the re-runs start, June 4), will likely involve some sort of discussion about the plans for the third season, which are detailed here. Reaper remains among a handful of TV shows to either feature at its core a relationship between the Devil and a man (Brimstone) or a focus on the after-life (Dead Like Me) to burn brightly but only shortly. For my money, Tyler Labine’s performance as Sock is one of the funniest characters on American television from the past decade, and Wise’s take on the Devil is the new gold standard for anyone attempting a comedic spin on the Prince of Lies. The show isn’t coming back, and it probably shouldn’t (show revivals do not often work). However, it should be fun to see the main cast talking about the show for a half-hour, like a televised version of a Comic-Con panel appearance. What about you? Fan of Reaper? New to the show? Would rather have new episodes than anything else? Get thee to our comments section.